Maggie Konstanski is the Asia & Southern Africa Program Officer for World Relief. Just back from her trip to Mozambique and Malawi, Maggie reflects on her visit. Recently I had the privilege of going to Mozambique and meeting women who did not give up. In January, flooding in the Gaza Province in Mozambique devastated villages close to the river. Homes were destroyed and crops that were almost ready to harvest were washed away. Significant damage was done to the infrastructure of these small farms, which many women depend on for survival. Flooding in Mozambique is not uncommon, but floods of this magnitude are only expected to strike every ten years or so. The trouble with this most recent flood is that only last year floods destroyed homes and livelihoods in these same villages. Two years in a row these farmers have watched their livelihoods swept away by flood waters. Two years in a row these farmers have suffered significant losses. Two years in a row they have faced the discouragement of loss…and they have not given up. When I showed up at the first farm I was expecting to see damaged fields. Yes, there was significant damage. The harvest had been lost, much of the infrastructure was destroyed and sand from the river covered the soil. Then I looked further and I saw a makeshift nursery full of little seedlings popping out of the soil. The start of new life breaking forth from the soil always gives me a sense of hope. 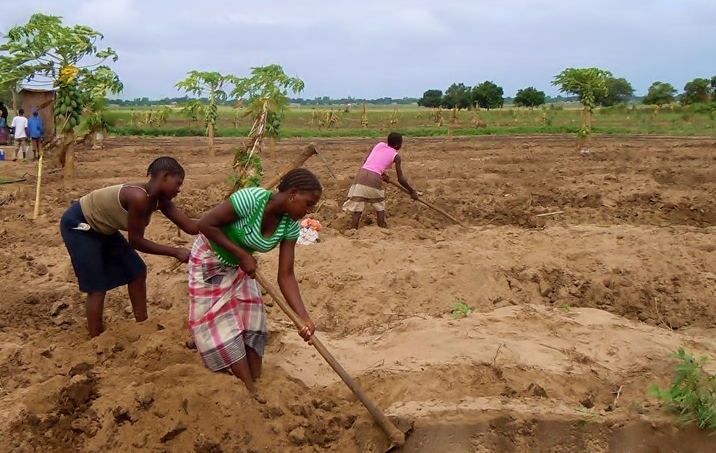 Women were hard at work in the field preparing to transfer the seedlings from the tray into the ground, doing the hard work of removing sand, repairing damaged structures and preparing the field. This is no easy job. I helped lift a few bags of cement and fertilizer. I am a relatively strong person and I could barely manage on my own. I think these women are some of the strongest women in the world. Most of them were lifting far more than me and they had babies on their back! I think I need to start lifting weights when I get home! It is not necessarily that I was surprised to see these women hard at work. This is how they survive and it makes sense that they would want to replant as soon as possible. What surprised me was the resilience. I feel like if I was a farmer I would have a somewhat fatalistic attitude towards the field. I would be expecting something to go wrong and express anger when hard times struck. Yet these women were working together to make sure that everything was planted in time and they worked with grace and joy. They were quick to express their desire to replant and repair the fields. Yes, there was discouragement, but they did not let the discouragement defeat them. They would replant and wait for that new life to grow. I have a lot to learn from these women. It is easy to become discouraged and to want to give up. They reminded me that we will face many trials, but we must have the strength to keep going. We do not know when floods will strike, it could be next year and it could be in ten years from now. But we can choose how we respond. We can get stuck in discouragement and give up, or we can return to the field and place the seedlings in the ground as we cling to hope. Follow Maggie Konstanski on her blog.